During a trip to Cincinnati, a buddy of mine made a trip across the river into Kentucky to grab a few bottles. 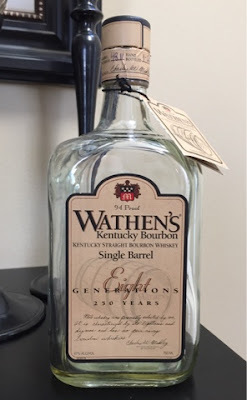 While there, the owner of the store he went to recommended this bottle of Wathen's Single Barrel, heaping some high praise on the particular barrel out of which this one was bottled. That's what I've come to love about single barrels, that different bottles will have different characteristics, and some may be better than others. Having never had Wathen's before, I cannot compare this particular bottle to other bottles I've tried, but I certainly looked forward to enjoying this one. The nose is your typical bourbon nose, strong on the vanilla and caramel. It also had a light orange smell to it, what was a bit unexpected. Any alcohol burn that may exist in this whiskey is not betrayed on its nose. At 94 proof, it's certainly not a high-proof whiskey, though. The first thing I noticed when I took my first sip was a distinct nuttiness. I immediately thought of walnuts, but the more I thought about it, the less sure I was that's what it was, perhaps more of a filbert. Either way, this has a very earthy, nuttiness to it. It also had a mild spiciness on the back end as well, though not enough to characterize this as a "spicy" bourbon. Interestingly, after the bottle had been open for a bit, there was at the same time a fruitiness to it as well. I noticed dark fruit flavors, like cherry or plum, but I also noticed a mild orange flavor as well. This all complemented the traditional vanilla and toffee flavors that dominated. While at first it came across as nutty and a bit woody, after being open for a while additional flavors came through, making this whiskey more complex than my initial pours. It transformed into a very smooth, enjoyable pour. It was a bit watery for my tastes. I like flavor that sticks around a while, and that was not the case here. It also struck me as a somewhat young whiskey. There is no age statement on the bottle. If I had to guess, I'd say it's about a 6 year old bourbon. I like my bourbons to be a little older, or at least taste like they are.